The fiery descent of Atlantis… in 3D! Well, today is certainly shaping up to be "jaw-dropping pictures of Atlantis day"! How so? Well, I already posted the stunning image of the Orbiter’s descent as seen from space, and just the other day I mentioned how I was hoping Nathanial Burton-Bradford would make more 3D images… so guess what? Get out your red/cyan glasses: here’s the plasma-lit descent of Atlantis as seen from space in 3D! Wow! The ISS astronauts took several pictures of the Orbiter as it descended. 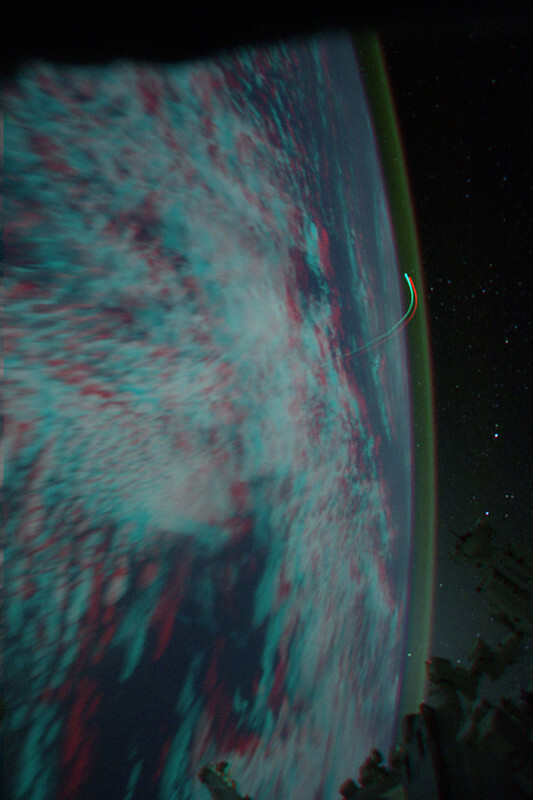 Nathanial took two of them from NASA’s spaceflight gallery and combined them to make this anaglyph. If you click between the two original shots (here and here) you can see they were taken a few seconds apart; the motion of the stars, the Earth, and the plasma plume change a little bit (click between them rapidly and you’ll actually get a feel of the motion. Weird). The other pictures at the NASA page are amazing as well. Funny, when I first heard of the plasma picture I poked around NASA’s site and couldn’t find any other images, but clearly I either missed them or they weren’t up yet. I’m glad Nathanial dug deeper! In his shot, you really get a sense of how far away the Orbiter was from the ISS. In fact, there is a layered feel to the whole scene, with the stars far away, the ISS in the foreground, and the Earth itself stretched out from below you to the horizon. If you don’t have red/cyan glasses, this one shot makes it worth the effort. It’s truly amazing. More than just a gimmick, a picture like this really gives you a visceral sense of what you’re seeing. Truly wonderful. – ISS and Atlantis seen in broad daylight!